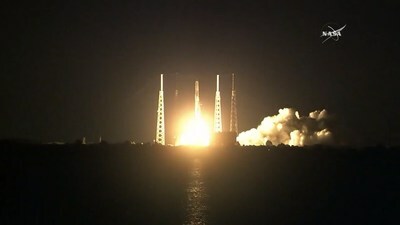 IRVINE, Calif., June 29, 2018 /PRNewswire/ -- Cryoport, Inc. (NASDAQ: CYRX, CYRXW) ("Company"), the world's leading temperature controlled logistics company dedicated to the life sciences industry, announced that biological samples transported by Cryoport were launched today at 5:42 am EDT on SpaceX's Falcon 9 rocket which took off from Cape Canaveral in Florida to the International Space Station (ISS). On May 25, 2018, Cryoport managed the transportation of biological samples, specifically isolated primary human mononuclear cells from blood donors, from the University of Zurich to the Kennedy Space Center. These biological samples were cryogenically shipped to suspend all metabolic activity; biological samples like cells, if not kept below -150C will lose structural integrity, which then has a negative impact on their native functionality. This would destroy the ability to use the samples for the experiment. The biological samples shipped by Cryoport will play an important role in two experiments being conducted at the International Space Station (ISS) by Dr. Oliver Ullrich, Professor of Space Biotechnology at the Otto von Guericke University Magdeburg. The experiments are designed to answer how human cells adapt to weightlessness and how disturbances in the immune system and bone system for longer stays in space can be avoided in the future. In both experiments, human scavenger cells (macrophages), which have been obtained from blood donations, serve as the object of investigation. These cells normally "cleanse" the body of harmful bacteria and dead cells. Jerrell Shelton, Chief Executive Officer of Cryoport, commented, "Temperature controlled logistics is rapidly growing in importance in the life sciences industries as advances and developments in cellular and gene technology require temperature-controlled environments. The University of Zurich has already recorded the fact that cells compensate ultra-rapidly for changes in gravitational conditions and its scientific team desires to further their work. We are pleased that our temperature controlled logistics solutions have been chosen to support the University of Zurich's research in space and its mission to drive innovation and advancements that will change the course of mankind." When SpaceX returns from the ISS at the end of July, the biological samples will be cryogenically transported by Cryoport from the Kennedy Space Center to the University of Zurich. Interested viewers can watch the arrival and installation live on NASA Television and NASA.com beginning at 5:30 a.m. EDT, Monday, July 2. Cryoport is the life sciences industry's most trusted global provider of temperature-controlled logistics solutions for temperature-sensitive life sciences commodities, serving the biopharmaceutical market with leading-edge logistics solutions for biologic materials, such as regenerative medicine, including immunotherapies, stem cells and CAR-T cells. Cryoport's solutions are used by points-of-care, CRO's, central laboratories, pharmaceutical companies, manufacturers, university researchers et al; as well as the reproductive medicine market, primarily in IVF and surrogacy; and the animal health market, primarily in the areas of vaccines and reproduction. Cryoport's proprietary Cryoport Express® Shippers, Cryoportal™ Logistics Management Platform, leading-edge SmartPak II™ Condition Monitoring System and geo-sensing technology, paired with unparalleled cold chain logistics expertise and 24/7 client support, make Cryoport the end-to-end cold chain logistics partner that the industry trusts. Statements in this news release which are not purely historical, including statements regarding Cryoport, Inc.'s intentions, hopes, beliefs, expectations, representations, projections, plans or predictions of the future are forward-looking statements within the meaning of the Private Securities Litigation Reform Act of 1995. It is important to note that the Company's actual results could differ materially from those in any such forward-looking statements. Factors that could cause actual results to differ materially include, but are not limited to, risks and uncertainties associated with the effect of changing economic conditions, trends in the products markets, variations in the Company's cash flow, market acceptance risks, and technical development risks. The Company's business could be affected by a number of other factors, including the risk factors listed from time to time in the Company's SEC reports including, but not limited to, the Company's 10-K for the year ended December 31, 2017 filed with the SEC. The Company cautions investors not to place undue reliance on the forward-looking statements contained in this press release. Cryoport, Inc. disclaims any obligation, and does not undertake to update or revise any forward-looking statements in this press release.